LADCO participates in air quality research projects to improve our understanding of air pollution science in the Great Lakes region. We partner with federal research labs, universities, non-governmental organizations, and private companies to design and execute air quality research projects. Identifying and addressing knowledge gaps in the science of air pollution, finding new ways to gather and analyze atmospheric data, and improving the interface between science and policy are the types of projects in which we typically engage. 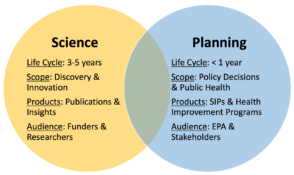 Schematic of applied science comparing the differences in air quality projects in the scientific and planning domains. LADCO engages in both basic and translational research projects. Our basic research projects generally focus on improving our understanding of the physical and chemical drivers of air pollution, enhancing how we simulate pollution emissions processes, and developing new data analysis techniques. We are also involved as collaborators on applied research projects to represent the perspectives of air quality planning agencies. In these translational projects, LADCO works in the interface between science and policy to translate communication and objectives across the two spaces. Click the study name below to expand/collapse the menu for highlights of current and recent air quality projects in which LADCO has been involved. The 2017 Lake Michigan Ozone Study (LMOS 2017) was a collaborative, multi‐agency field study of ozone chemistry and meteorology along the Wisconsin‐Illinois Lake Michigan shoreline using a combination of aircraft, ground‐based and ship‐based measurements. The Lake Michigan region has persistently high ozone concentrations that are impacted by complex meteorology and significant transport of pollutants. The overall goal of the study was to better understand ozone formation and transport around Lake Michigan to assist researchers and air quality managers who study, predict, and manage ozone concentrations in the region. The 1991 Lake Michigan Ozone Study (LMOS 1991) was the first major air pollution and meteorology field campaign that targeted the western shores of Lake Michigan. The document archive for LMOS 1991 is available below. Linking Surface Monitors, Satellite Data, and Emissions Inventories to Investigate Regional Haze Trends in the Eastern U.S. In 1999, EPA promulgated the Regional Haze Rule (RHR) to improve and protect visibility in the nation’s national parks and wilderness areas. Because the fine particles that impair visibility can travel for hundreds of miles, the RHR requires all 50 states to work together to develop strategies to reduce their emissions and impacts on the parks. Under the RHR, states must make reasonable progress toward the goal of “no manmade impairment” in national parks and wilderness areas by the year 2064. For the second Regional Haze Planning period, we are working with our member states to demonstrate reasonable progress toward this goal for the period 2018-2028. In 2000, the states of Illinois, Indiana, Michigan, Ohio, and Wisconsin formed the the Midwest Regional Planning Organization (MRPO) to address issues related to the federal Regional Haze program, and pollutants, such as fine particles, that contribute to regional haze. Key documents and the full MRPO document archive from this first regional haze planning period are provided here. Interested in collaborating with LADCO on research projects? LADCO both funds projects and participates as a collaborator on sponsored-research projects. Keep an eye on LADCO’s Request for Proposals page for funding opportunities with LADCO. Contact the LADCO Executive Director about partnering on air quality research and applications projects with LADCO.